Management by Gaming (MBG) is a newly developed strategy that allows businesses to better engage their employees and streamline their processes by integrating gaming mechanisms into their management framework. When used in conjunction with goals, SMART objectives and in-depth analytics, Management by Gaming becomes a powerful method that offers many organizational enhancements. The benefits of this management technique can be broken down into three foundational categories that delineate the “why and how” of MBG. In our model of an organization managed by gaming, team scores, badges, and awards are earned through successful completion of business objectives. According to Dr. Loretta Breuning, author of Meet Your Happy Chemicals: Dopamine, Endorphin, Oxytocin, Serotonin, this type of reward system creates positive feedback in the human brain, which produces dopamine and serotonin during the gaming process, making us feel good.Success breeds future success in this neural response pathway, as people have an inherent desire to pursue that good feeling. In the workplace, this translates to greater efficiency and alignment of employees to their tasks. Ultimately this system manifests as productive competition in the office, as individuals and teams strive to achieve certain benchmarks and awards. Organizations are beginning to understand these intrinsic psychological mechanisms and their potential for increasing employee motivation. With internal gamification, employees often work together in teams to complete sets of objectives. When teams of individuals draft their own objectives that are appropriately prioritized and tied to points (and subsequently tied to badges and awards), a greater sense of personal involvement is developed. This sort of real-world application has been praised by thinkers like Dr. Jane McGonigal, a world-renowned game designer and author, who posits that current lack of engagement in the real world could be solved with the implementation of gaming mechanisms into formerly non-gaming environments.In working environments that take on gamified traits, employees become more invested in the completion of their work, as it is directly tied to the success or failure of their team. 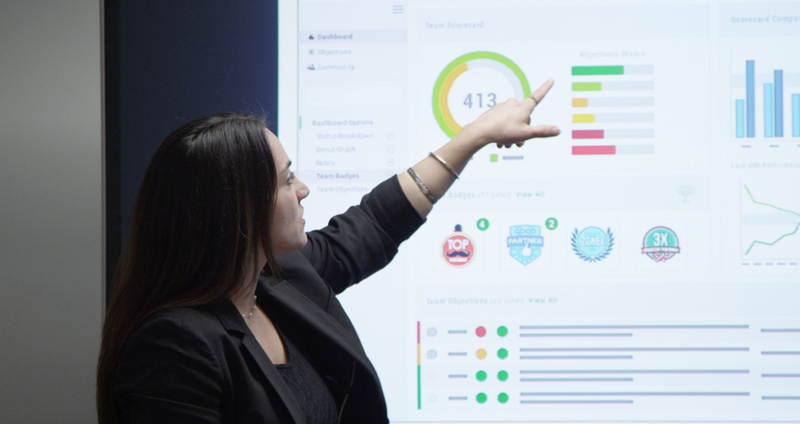 MBG creates a scenario in which engaged individuals are collaborating as teams, which are increasing productivity through healthy competition for badges and high point scores. An important facet of any organization that tracks information related to their internal processes is the acquisition and analysis of pertinent data. The ability to collect meaningful data gives the organization an opportunity to better understand the health of their internal functions. Gamified platforms are a great way to collect data on teams and individuals, as they are consistently tracking their successes, failures, point scores, growth, etc.These defined metrics give access to simple and fast analysis, which in turn allows teams to better understand their functionality and how best they can structure themselves around their objectives in the future. Easy access to defined metrics for analytics through an MBG platform means that organizations will be able to quantitatively determine which processes yield growth and success, and which ones do not. In order to create a successful platform for Management by Gaming, all three of these categories should be encompassed in the strategy. One software solution that successfully achieves the fully encompassed strategy is MyObjectives. Using a gamified structure, this software allows teams to draft time-specific objectives that are tied to organizational goals. At the end of the specified time-period, points and badges are awarded based on certain criteria pertaining to the objectives, including their given priorities and status of completion. To better prepare for the future, in-depth analysis tools track certain metrics throughout every time-period, giving teams a better method of pinpointing successful and unsuccessful strategies. Combining both modern and time-tested ideas in a gamified system, MyObjectives software is bringing exciting and innovative changes to business management.